I think Google Analytics is a really great tool. I have enabled it for this blog and it allows me to find our all sorts of interesting facts about the people who visit the site. 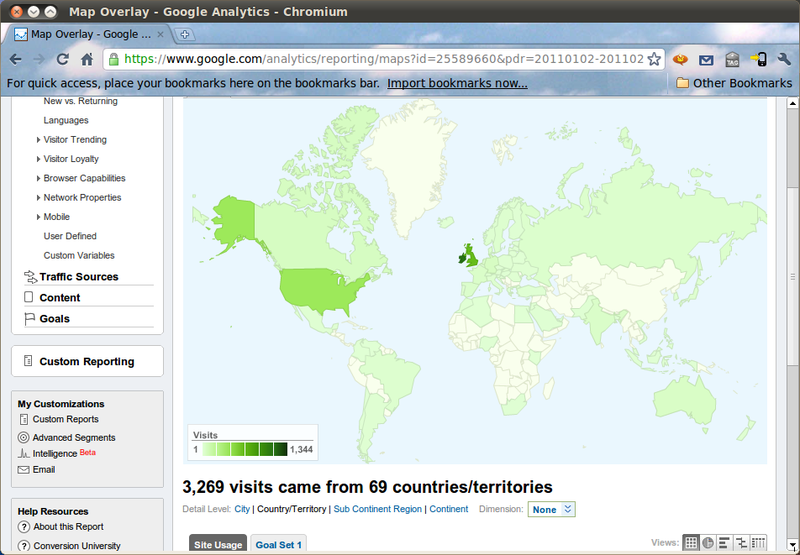 For example I recently was looking at the data for what countries the visitors to the blog are coming from. The darker colours indicate countries from which more visitors came. 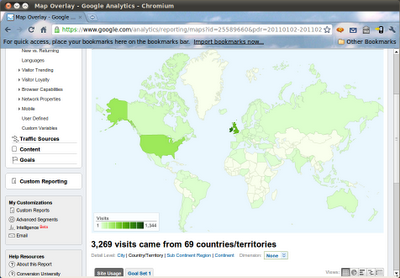 I was not surprised to see that 41% of the visitors came from Ireland. The next most common country of origin was the UK (24%) and USA (15%) which wasn't surprising either. However, I was surprised to see how widely dispersed the visitors were. I have visitors for virtually all of the world apart from Greenland, and some countries in Africa, South America and Asia which might not have many internet users. Another notable exception was China which I suspect could mean that my site is blocked by the Great Firewall of China. I doubt if any Chinese censor has read my blog and found it objectionable, but perhaps all blogger based sites are blocked.